Oops. Pat McAfee is a great guy and I’m sure this was an accident. He even sent a very heartfelt apology right after. Things got pretty exciting in the Colts locker room after Indianapolis came back from a 38-10 halftime deficit to beat Kansas City 45-44 on Saturday. Colts punter Pat McAfee wanted to share that excitement with his almost 170,000 followers on Twitter, so he tweeted out a picture of Indy’s locker room. The only problem is that McAfee didn’t stop to check if there were any half-naked quarterbacks in the picture before he tweeted it out. 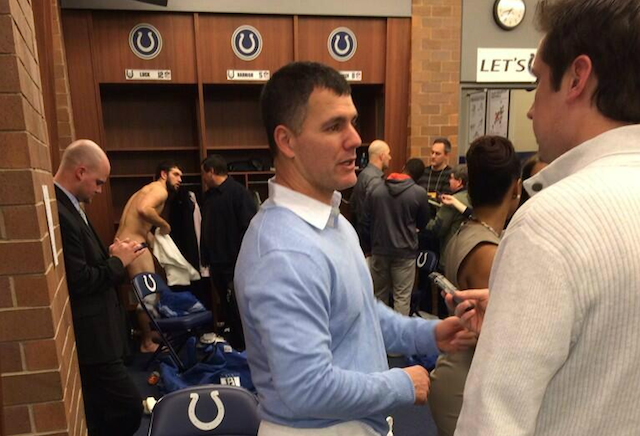 As you can see above, Andrew Luck wasn’t quite finished putting his clothes on when McAfee took the photo. Actually, it looks kind of like Luck hadn’t even started putting his clothes on.